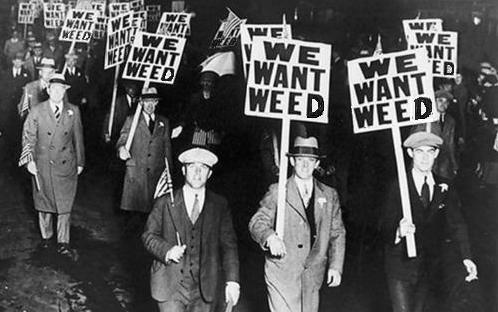 Is This (The Beginning Of) The End Of Prohibition? Potheads in the two states have been celebrating well in advance of any consent from the Department of Justice, with plans already in place to direct tax money from legal sale of the drug into the construction of schools (oh, to be young enough to enrol in the first real High School) and a range of health programmes including drug and alcohol treatment. Oregon just lost out on legalising weed – although, with arguably the most liberal initiative of the three states (they wanted unlimited personal amounts and growing privileges), but by far the smallest campaign budget, this outcome is perhaps understandable. Maybe next time, Oregon. I’ve got my mental fingers crossed for you, ‘n all. Another good piece of pot-related news came in the form of the Mayor of Amsterdam’s announcement (to admittedly negligible surprise) that foreign tourists will not be banned from using the city’s coffee shops. Wasn’t that a lot of worry for nothing – cannabis café owners fretting over the loss of tourism, the Mayor facing the prospect of the city descending into a miasma of dodgy street dealers and shoddy merchandise, not to mention us lot sitting worriedly on the couch in front of the laptop, trying to work out how to fit in another jaunt to Holland before the law came into effect. Worry over, anyway. All this liberalism has been making me feel just a little bit as though I’m living in some kind of backwater, conservative commune, rather than one of the world’s most awesome global cities. While we’ve been resting back in our creaking leather armchairs, passing the brandy and gently chuckling at the antics of our younger cousin, America’s been getting on with surpassing us in some pretty damn important arenas. Britain upgrades cannabis to Class B, America legalises it first for medicinal and then recreational use. America gets Obamacare, while in Britain we’re in danger of losing our internationally-lauded NHS to the fickle whims of privatisation. Our PM reveals himself to be an immoral wheeler-dealer of war machines to the Middle East, while in America a genius businessman fights to use his enormous wealth to develop clean energy for all. Oh wait, that was Iron Man. But you get the point. But anyway, back to America. What does this legalisation of pot mean for them? Well, I can’t imagine that the Department of Justice is going to roll over on this one, if its initial, tight-lipped “no comment” reaction is anything to go by. Presumably it will cite precedent, and complain of the difficulties in managing a country in which some states allow the use of a drug while other states battle smuggling issues and criminal activity. Or perhaps it will just bring its big federal boot down and yell “I said NO!” Which would be a shame because, as some have already pointed out, this could be a great opportunity to start to address the longstanding conflict between state and federal laws. It seems bizarre that you can do something that’s both legal and illegal at the same time. Personally, I see this as a case of political and legislative stagnation rather than mere precedent, but surely even two states deciding to legalise cannabis evidences a sea change worthy of review on a federal level? At any rate, the Department of Justice needs to make a decision soon – it would be a phenomenal waste of resources if Washington and Colorado got too far into their implementation and were then told it’d all been for nothing. A much more immediate issue is, of course, the impact of legalisation on drug cartels. Make something legal, regulate it, keep the quality to a certain standard, make it easily obtainable… why would anyone choose instead to buy off some shifty dealer who may well be bulking out the product with sugar or sand in order to turn a profit – someone who, in turn, has to handle the paranoid people one level up, who sometimes deal in much nastier things than weed and occasionally wave a gun in their face? It’s a no-brainer. Obviously the lords aren’t going to be too happy about it, but any savvy street dealer or home grower with half a brain should be looking to capitalise on the change in law and set up shop legitimately. More money, less risk. Another no-brainer. Ok, so I’m over-simplifying. There are many knots to be massaged out of this legislation, including how to test for “drug-drivers” without accidentally penalising medical marijuana users (though, to be fair, if you have enough in your system to be considered too impaired to drive, you probably shouldn’t be driving). But this has got medical marijuana users understandably worried – will the tests be good enough, will they be fair? It’s something that needs to be worked out and set in place beforehand in order to avoid wrongful arrests, but it shouldn’t be a permanent barrier to legalisation. Calm down, guys. Put your feet up and have a smoke, why not? Surprising enough as is opposition to legalisation from those who can already buy and smoke legally, it’s as nothing when compared to the support from anti-drugs campaigners. Funny what the promise of funding for rehab programmes can do to a person’s views – but I guess it’s no weirder than a government taxing alcohol and tobacco and then pushing tax money into a healthcare system that provides treatment for diseases caused by the consumption of alcohol and tobacco. Funny old world, eh? I’m not even going to mention the utter hypocrisy of a system that’s been benefiting from the abuse of certain substances while punishing the use of others. Or add my voice to the millions of those yelling that “the war on drugs isn’t working”. The evidence speaks for itself. Whatever the outcome in the US, full credit to this significant minority of America that has had an attack of rationality and accepted that the legalisation – and, therefore, regulation – of marijuana is the only way forward in the so-called “war on drugs”. You can’t stop people experimenting with drugs – human beings have been getting high for millennia – but you can do your utmost to ensure that personal risk is minimised, in this case by taking power away from criminals and regulating your product for quality. Oh, and did we forget it can be taxed, just like alcohol and tobacco? Legalised weed is an untapped, potentially hugely lucrative source of revenue for an ailing economy. I wholeheartedly wish that British politicians would stop pandering to the sensationalist media and recognise when to act for the benefit of the people. We’ve got Tories running the show now, for god’s sake – surely they of all people should be able to spot when they’re missing out on a fantastic business opportunity? This is Your Government on Drugs! 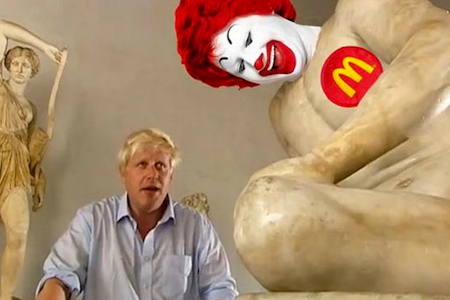 A bad trip for Boris? “The plain fact of the matter is drugs are incredibly addictive, they destroy lives”. So said Tory MP Louise Mensch, successful politician, bestselling author, mother-of-three, wife of Metallica manager Peter Mensch, and former Class A drug user whose dabbling with certain unnamed narcotics has clearly ruined her life. Yes. Ruined. So she’s quitting the low-down, dirty, hand-to-mouth insecurity of political life in the UK and moving to America with the family, where hopefully life will be easier, more tranquil(liser). And as for some of the others… Bush Jnr abused alcohol (and allegedly cocaine); Clinton admitted to having a couple of puffs on a joint whilst studying in England, but not inhaling or liking it (oh, blame the Brits for leading you astray, eh Willie? ); Mayor of New York City Michael Bloomberg was more candid, even going so far as to say that he has enjoyed smoking marijuana in the past. Al Gore and Sarah Palin have both been ‘outed’ in biographies as former dope smokers (add cocaine use to that, in the case of Miss Alaska). This kind of name-dropping is not intended to shame those in the spotlight, but rather to highlight two things: firstly, that dabbling in recreational drugs is extremely common, and secondly, that doing so does not automatically condemn one to a life of petty crime and back-alley blowjobs. I’m terribly sorry, Louise, but your “plain fact” of my first paragraph is anything but. Drugs can be addictive, and they can be a major factor in “destroying” lives (what a horrible little phrase), but neither one of these claims is absolute. It is, in fact, quite absurd to just lump all controlled drugs in together like that; are we expected to believe that alcohol and heroin are equally addictive, equally life-destroying? Morphine is Class A, but doctors use it to alleviate severe pain in their patients – may I therefore infer that it is the application of the drug, not the drug itself, that we ought to be controlling? Fast food can be just as detrimental to health when ingested to excess, and obesity can and does ruin the lives of those who suffer from it as well as impacting on the lives of those around them; are you intending to ban fat and sugar for all, too? I’m sure you’ll recall that, about four years ago, the Advisory Council on the Misuse of Drugs (ACMD) presented its conclusions regarding the dangers of cannabis use – conclusions that resulted in the dismissal of the Council’s chairman Professor David Nutt and the resignations of several other members of the ACMD. The problem, in essence, was that the Council’s findings did not support current government policy; against the Council’s advice, cannabis was reclassified as a Class B controlled substance. A study published by Nutt et al. in The Lancet in November 2010 reiterated that, using the multicriteria decision analysis approach (which took into account personal harm, social harm etc. ), alcohol is the most harmful substance. I’m using percentages here to represent the study’s arbitrary ‘points out of 100’ scoring system of overall harm: alcohol achieved 72% on this scale, with heroin and crack cocaine ranking second and third respectively at just over the 50% mark. Cannabis was ranked much lower at 20%, making it 6% less harmful than tobacco. Magic mushrooms, LSD and ecstasy can be found huddled at the far end of the chart, each with a score under 10%. I found the scores for LSD and mushrooms particularly interesting because, as well as being of only very slight risk to users, they were deemed to be of absolutely no risk to wider society – and yet both substances are currently Class A, which can get you up to seven years in prison and a hefty fine. Even more interesting is DirectGov’s explanation that drugs are categorised as Class A, B or C “according to how dangerous they are.” Hmm. That’s a lie, isn’t it? But I digress. The plain fact, Louise, is that just because you don’t like something doesn’t mean it should be prohibited by law. Or, as your fellow Question Time panel member John Lydon observed, “Just because you’ve had a bad time of it… Let us, as human beings, determine our own journey in life.” If you want to keep drugs illegal because of the damage they can do, you should also be fighting to make alcohol and cigarettes illegal, or you’re just being a hypocrite. If you want to allow people to make their own choices based on accurate information made available to them (and, perhaps, turn a tidy profit in tax), you’re going to have to legalise all drugs – or at least the ones proven to be no more damaging than tobacco, alcohol, and over-the-counter pharmaceuticals. But you cannot simply rally against something because it has personally upset you at some point. Your personal experience is not the experience of others, and to legislate based on personal views is to deny experiences to other people. You cannot keep people safe by stopping them from doing any activities that carry any risk. We must defer to evidence, to cold hard facts, and then disseminate this information as clearly as possible, in order to adequately equip those who are determined to take such risks. I recently came across the notion of “truthiness”, a term coined by American satirist Stephen Colbert (The Daily Show, The Colbert Report) to explain the increasingly popular, and increasingly worrying, trend toward decision-making based on gut feeling rather than facts. Mr Colbert had in mind certain politicians of his own country when he said this, but I can see a very similar trend in the UK. In the case of drug legislation, surely it makes more sense to classify substances according to the harm they do, rather than political agenda, or societal perception (which, let’s face it, is usually based on very little information and sensationalist negativism courtesy of the mainstream media)? If we base policy on evidence instead of opinion, how can there be any arguments?